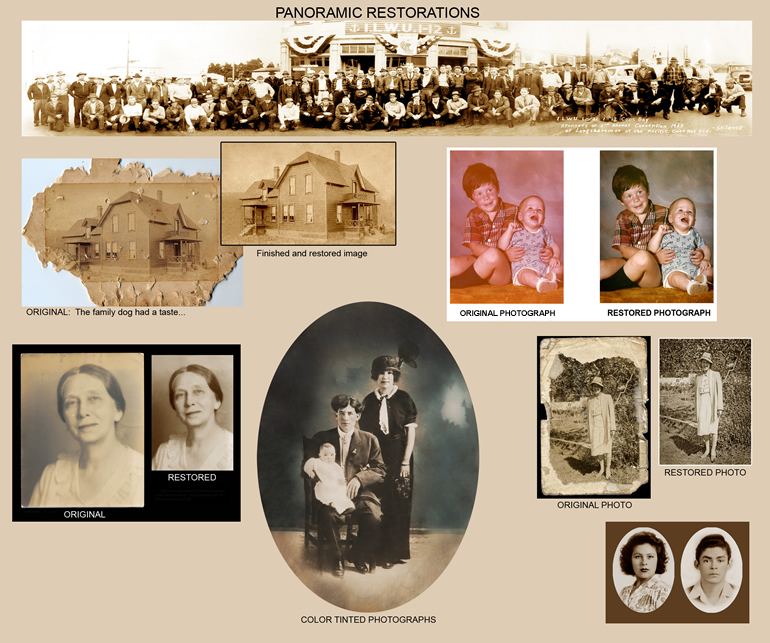 Restoring and bringing your old photographs back to their original look is our specialty, We can reproduce your original and make you multiple copies of your photographs to share with other family members. We can repair torn, faded or water damaged originals. We do not work on the actual original image but on a reproduction. You will get your original print back the way you brought it to us. many times our reproduction will look better than the original. The condition of your photograph will determine how much work will be necessary. It may be a simple copy and print service or an extensive repair to a valued family photograph requiring much more attention. All work is done in our North Bend location and your valuble photographs will not leave the studio, insuring their safety while in our possesion. Bring in your photos for a estimate. Since there are so many factors that will determine the cost of your restoration we would like to see the photo before quoting a cost for a extensive restoration. Otherwise please call if you have any questions about this service. We look forward to hearing from you.